The General Services Administration has been in the news for some fairly questionable spending recently. Bankrupting America has uncovered some revealing footage surrounding the infamous conference in Las Vegas and the planning that went into it. Check out the fact sheet here. You just have to love the way FOXNews reporter, Ed Henry, used White House Press Secretary Jay Carney’s own twisted tongue, to tie him in knots during the regular press briefing yesterday. Henry was not going to allow a single, false Obama phrase to go unchallenged before the media. Even Lawrence Tribe, the famed Constitutional Law professor at Harvard, and mentor to Obama, couldn’t defend the president’s few remarks, by saying [he] … “obviously misspoke,” according to Jared Favole’s article in WSJ Washington Wire yesterday. There is another direction of thought, which is totally contrary to Tribe’s closing statement above, postulated by Rush Limbaugh yesterday on his radio program. Mr. Limbaugh believes that President Obama knew exactly what he was doing–not only with the timing, but also the very choice and delivery of his words, knowing the willing and compliant mainstream media would quote his few, simple [totally false] remarks–while the videos captured his clear, threatening emphasis against the court, precisely. 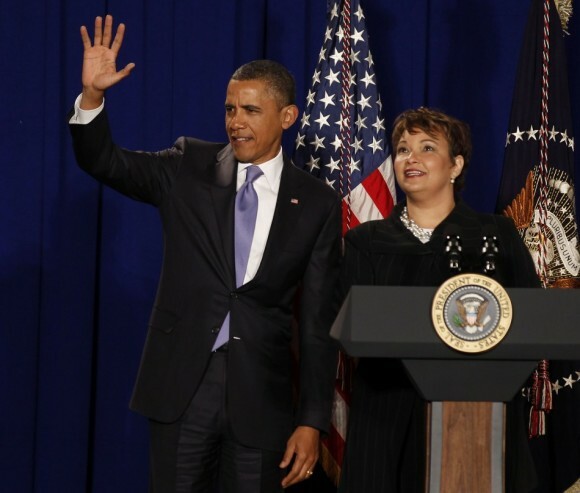 Many believe that Obama has been “tipped off” that the vote did not go in his favor–possibly by SCOTUS Justice Elana Kagan’s camp, as she was his former Solicitor General, and in fact, was a key element in the construction of Obamacare. As such, Obama felt he needed to get out in front of the final ruling being handed down, scheduled for June, to isolate and demonize the Supreme Court, by strongly implying that if the Obamacare Mandate is struck down by the court, the [Conservative] Justices will be responsible for having taken away the “free” healthcare that “he” had “provided” for them. This would be another in the long parade of attempts to incite another divisive distraction away from president’s factually-failed first term as president, hoping to garner votes from these people, who he believes will think that if reelected, somehow Obama could neutralize the court. Eric Holder complied, but not without a clear sense of “passive aggressiveness,” for the same voter base to view as a thinly veiled contempt for the court. A review of Holder’s letter, available via interactive link in the FOXNews article today, reveals a preamble that amounts to second closing statement in defense of the government’s position on Obamacare. The entire second page are case law cites, which appear to be promoting the posture of Obama’s controversial, threatening statements to the court. And, it did not go without notice that although the letter was the required three pages long, after subtracting the substantial header on the first page, followed by a lengthy internal address, and the fact that there was a single paragraph, covering only one-third of last page above Holder’s signature, at best, the substance of the letter accounted for a paltry two pages. Chief Justice of the U.S. Supreme Court–John Roberts. The notion that President Obama is trying to fire up his “base,” as he prepares for a re-election campaign, raises the question of what constitutes his base. It is becoming increasingly clear that the “workers” he is supposedly concerned about are going to be dismissed or ignored so that wealthy environmental groups can be accommodated. Consider the words of Cecil Roberts, president of the powerful United Mine Workers, an affiliate of the AFL-CIO, after EPA administrator Lisa P. Jackson made a ruling against coal plants. “The Navy SEALs shot Osama Bin Laden in Pakistan and Lisa Jackson shot us in Washington,” Roberts said. Those who missed the news about Jackson shutting down coal plants through executive branch rules and regulations may have been unprepared for the Roberts assault. It was a big story for the media but framed in a way that played down the significance of what is taking place. “For New Generation of Power Plants, a New Emission Rule From the E.P.A.” was the misleading headline over the story in The New York Times. Much more is at stake than just a “new emission rule” that is somehow supposed to affect global warming. Before becoming the EPA Administrator, Jackson served as chief of staff to New Jersey Governor Jon S. Corzine, who also served as a New Jersey senator before running the MF Global financial group, now embroiled in scandal and corruption over $1.2 billion in missing money. Jackson had been appointed by Corzine to be commissioner of the state’s Department of Environmental Protection in 2006. Jackson’s attack on the coal industry will help China and other U.S. competitors. Although the United States is considered the Saudi Arabia of coal because data show that U.S. currently has the world’s largest coal reserve, America is far behind China in terms of coal production and will fall even further behind because of the new EPA regulations. The Soros-funded blog, Think Progress, called Roberts’ statements “preposterous,” a fascinating reaction that suggests that Obama is prepared to throw the mine workers down the shaft. The purpose of Think Progress, an unofficial arm of the White House, is to punish anyone—even Democrats—who speak ill of the President or his policies. The big news is not only that Democrats like Manchin and Roberts are rejecting the Obama policy, but that an Obama-appointed judge, Amy Berman Jackson, recently ruled that the EPA exceeded the agency’s authority and violated federal law when it revoked a coal mining permit in Logan County, West Virginia. All of this was predictable. “If someone wants to build a new coal-fired power plant they can, but it will bankrupt them because they will be charged a huge sum for all the greenhouse gas that’s being emitted,” then-candidate Obama said in 2008. In a 2011 special election, Tomblin, then-acting governor, won with 49.47 percent of the vote to Republican businessman Bill Maloney’s 47.14 percent. Maloney is running in West Virginia’s May 8 primary against fellow Morgantown Republican Ralph William Clark for what he hopes will be a rematch with Tomblin this year. Hello fellow history buffs! I found out something scary the other day while watching a man doing a small pro-life film and interviewing university students about Hitler and abortion. He found out that 17 out of the 20 students had never heard of Adolf Hitler or the history of Nazi Germany. So what this tells me is that even at the high school level, in public schools they’re not bothering to teach about the most important parts of both world history and the importance to recognize real evil in the world when it speaks. I am betting they don’t talk about Joseph Stalin, Benito Mussolini, Chairman Mao, Roosevelt’s New Deal, the Soviet Union’s American spy network, the spread of Nazism to places like Baghdad, Egypt, Serbia and Croatia, real Communist antisemitism or heroes fighting Hitler from within. None of these things are even hinted at in most public schools. Go ahead and ask your kids what they learned in world history today; see what they tell you. Let’s look at the very small cross-section of history of these political philosophies and recognize the results for what they are. In 1611, a little over 200 years before Karl Marx was born and became the loser crybaby of all time, the Puritans sailed to the New World. They needed financial help for the trip, so they asked some businessmen for money. The men agreed to help on one small condition; that they had to follow a COMMUNAL style of living and government. They thought nothing of it at the time and received the money they needed. Their ships made it to their new home. They called it James Town And they discovered much to their dismay, how communal living caused massive amounts of laziness, misery and a 60% death rate during the winter. EPIC FAIL. When the Wiemar Republic was on its last legs from its own financial meltdown, a little smarmy snot named Hitler was not enamored with either the Democratic Socialists or the Marxists running Germany. He wanted something along the lines of the holy Roman Empire with himself as Caesar. He had tried a coup before and it failed with jail time included. This time around, he carried out the takeover a little bit at a time and created the perfect villain for hungry and scared Germans to hate. Long story short, he lied to everyone, killed a total of 12 million people, was the richest scumbag dictator in Germany, invaded 7 to 10 countries, fought a losing 3 front war and put some of his own staff on trial for trying to kill him. He died in a bunker on fire. EPIC FAIL. An observation for a moment… even though the commies and socialists are both the same kind of monster, if you put them in a room alone, they will kill each other. Joseph Stalin was the inventor of the massive ovens and gas chambers that Joe’s short lived bromance partner Hitler, ripped off and used himself. Uncle Joe had a higher body count then the Nazis and was a certified Gypsy and Jew hater. Plus it gets better… talk to an older Ukrainian and ask them about Stalin and his “HUNGER GENOCIDE” campaign and the Ukraine’s swift upsurge in cannibalism within whole families. Then there’s the great way he treated Poland with his hard labor camps on one side and execution of their brave fighters on the other. EPIC FAIL. This is a very old and true Chinese curse. China, during their own Communist Revolution, was a living example of this curse for years. Chairman Mao, a great and humble man (sarcasm), found a way to kill more men and children without firing a shot. I mean, don’t get me wrong… Mao loved children in a Michael Jackson kind of way (YUCK). How about his love for beheading all those crazy barbarian Bible-reading Christians, huh? Mao loved Chinese industries, such as his forced abortion industry and his industrial strength death labor camps, where they made the term “digging your own grave,” a high art form. The only thing you could really get was 3 hots and a cot… That’s right. Join the big missile parade party and March like a Nazi. So, please get involved in your children’s education at the very start. Look at his/her teacher closely. Is he looking to indoctrinate or to educate? Look at the homework and carefully read every scrap of paperwork and the teacher’s notes before you sign anything. Want a suggested history book list? E-mail me [email protected].